If you are interested in coming bring warm clothes, sleeping bag or blankets, and water! We’re going in to 2nd night here. Heavy honking and conversations with people from cars. It was 7 of us here–now 5. 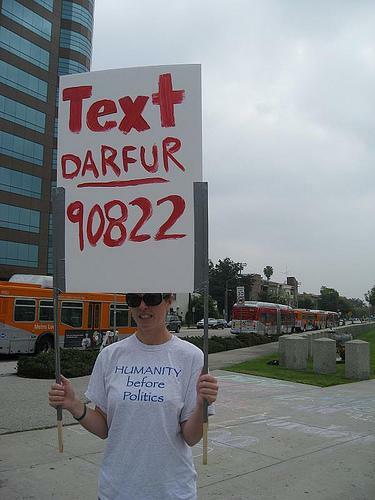 Thousands and thousands of people seeing and hearing DARFUR. We know genocide will not stop today because of us here, but it feels right to be here, and others are getting the message. Cool that Darfuris from Phoenix want to come! They come because it’s their family in the desert! That’s what we must get others to feel, that we’re all family (corny, but the whole city of LA would be out here tonight, if it was their family, their blood family, in the desert). We just had a fire engine shine its floodlights and honk for Darfur. It was cool to talk with Brian, and he grabbed a sign and talked with people; one guy stopped because he recognized Brian from his movie; he spoke with us for a long time, and now he wants to volunteer. Fr. V is the man! He came out himself in the morning and is getting people to be here. Check out the video below! Car just stopped on green light to ask what was happening. Not safe! Another car just stopped. It was an elderly lady that said she was Armenian and part of the first modern genocide. She asked Willow (sgn team) if she could give her some money to help. My little SGN team has been so amazing. We were on full-on preparations for going to refugee camps in a week, and we still are! But they took on all the extras from this- web/editing/media/coming out with food and so much more. Yuen-Lin told me, “There’s nothing more important for me to be doing right now.” Besides KTJ and I, no one on my team has ever received a cent for personal salary or stipend. They actually have donated too much, besides their time and talents. We need to change the game. All levels of activism are needed, but when we know the extremes of the dangers for the people we are working for–the reason why we’re all in contact right now–we have to move beyond traditional. Hell, we have been doing all the traditional forms of activism while here, on the sidewalk–e-mails, faxes, txts, and calls to White House, State Department, and Congress. The movement can do those in our sleep. It cannot be the only thing we do right now. We need to make this intense; we need to make it relentless. OK, I’ll stop. It’s very cool that I have wifi and my computer plugged in to a battery. –So our high-tech refugee camp continues here on Wilshire blvd!